Originally known as the Afghan Express, this famous Australian rail journey is now commonly known as The Ghan. Spanning 2,979km, the iconic route operates between Darwin, Alice Springs and Adelaide. Operating since 1878, this legendary rail service takes 48 hours to complete and offers some of the most spectacular scenery in Australia. The train was originally named for the Afghan camel drivers who arrived in Australia in the 19th century and helped to explore the remote interior of the country. Although construction began in 1878, the line wasn’t completed until 1929, three years after development reached Alice Springs in 1926. Following on from its original name, the remaining leg of the journey was made via camel until the line was eventually completed. Plans were made to extend the railway all the way to Darwin, however The Ghan was not making enough profit and these plans were put on hold. It actually wasn’t until as late as 2004 that the rail line was finally extended all the way to Darwin. The earliest versions of the railway often experienced washouts and delays, which meant that the first flatcar behind the tender was always equipped with spare sleepers and tools so that crew, and indeed even passengers, could repair the line and allow the train to continue its journey. Despite the sub-par service, passengers tolerated these issues because it was the only route with enough water available to power the steam trains. The service expanded during WWII however water supplies were limited and put under great pressure. De-mineralisation towers were built to enable the use of bore water and some of these towers survive to this day. The need for water diminished as diesel began to replay steam and the line was redirected to a more reliable course between Alice Springs and Tarcoola. These days, The Ghan is a popular tourist attraction with both Australians and international visitors counting it among one of the must see experiences of their lifetime. 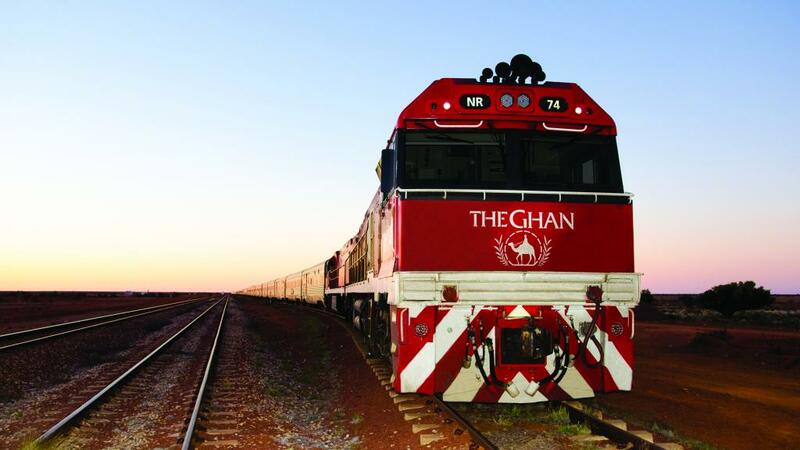 Still in operation, The Ghan is a popular way to explore the continent of Australia, travelling the vast distances between popular holiday destinations such as the Top End and Adelaide. The Ghan allows passengers to enjoy the amazing ever-changing Australian landscape in the comfort and convenience of modern rail travel.